This is the third in a series of blogs about favorite running spots. These are the spots where no matter how slow of a pace we did or how bad it felt...it is always a good run because we're in our favorite spot. If you have a favorite spot that you would like to share please e-mail me by clicking HERE. Thank you Jody for doing a great entry about your favorite running spot! Kentucky is a great place to run. I moved to here 3 years ago to take a job in Frankfort (the capital city) as a biologist. After moving to Kentucky, I quickly realized that, regardless of where I am, there is always a place to run close by whether it is a park, trail or quiet neighborhood. The greater central Kentucky area offers more running locations and running events than most people can keep up with. I however, am most familiar running the roads and trails of Frankfort. 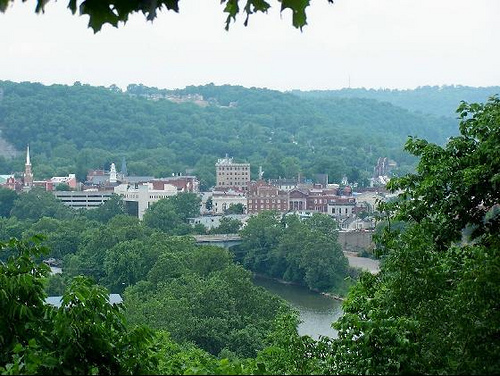 Frankfort, Kentucky is a small town by typical definitions with all of the pros and cons that come with that label. However, this is a good town for roads and trails and it has a good park system much like the greater central Kentucky area. Lakeview Park on Frankfort’s east side has been my go-to spot for some time because it’s an easy run and happens to be only ½ mile from my office. At lunchtime, I can get in 3-4 miles on its 1.7 mile trail. I’ve put in 15 miles there, but being a short trail, it gets boring quickly. Luckily though, there are lots of other locations to run in town so you don’t have to get bored. You have plenty of other choices for road running in Frankfort. Several quiet neighborhoods and other small parks are found on both sides of town. Also, sidewalks will take you most of the way from one side of town to the other. I’m not a huge fan of living in a small town, but I really like Frankfort’s downtown area. It’s a historic and picturesque area with a lot of sidewalks for a jog. It has good places to eat and fun little shops. This is also the location of the Black Cat Chase 5K, Frankfort’s largest 5K. The race happens each October near Halloween, and many will tell you that it’s a fun race. Any race that encourages participants to wear costumes should be. Even though there are plenty of roads and sidewalks to keep your feet busy, Frankfort has another feature that I like even better. The trail running opportunities. Move across town to the west side of Frankfort and you will find Salato Wildlife Education Center. This is operated by the KY Department of Fish and Wildlife Resources. Here you can run more than 3 miles on the wooded trails with enough steep hills to give you a very good workout. Salato also hosts a 4 mile trail run each November as it has for the past 3 years. I keep planning to run it, but my addiction to injury and letting life get in the way has kept me from it. But I won’t miss the next one. I’ll be at the Running Wild 4-Mile Trail Run in November 2012. Cove Spring Park is on the north side of town. There you can also run on more than 3 miles of trails. Because of recent additions to the park, Cove Spring is easily accessible to two different neighborhoods. On the south end of town and near the river, Capital View Park has 5 miles of trails. I have yet to run this park and for no good reason. The Capital View trails are shared by runners and mountain bikers. I have had the idea for some time to run from one side of town to the other while including the park trails. The distance from Lakeview to Salato is about 8 miles. When you add the trail distance, you can get a 13 mile run. Cove Springs also happens to be connected via trail to the subdivision immediately behind Lakeview Park. I’m a ways from being ready for this 19 mile trail and road challenge. But it’s on my radar. Other than the ample running locations, Central Kentucky has good running weather. Even though central Kentucky is described as having humid summers, it is still mild compared to other areas of the southeast. I’m from the coastal south, so I love the lower humidity here. I asked my wife what she likes about running in Frankfort. Her initial reply was “Well, it’s the only place I’ve ever run”. But as she continued, she echoed another sentiment that I have for the area. I love the hills here. The changes in topography make runs more interesting while giving you a better workout. Frankfort is a very hilly town from east to west. Also, you are only 1.5 hours from the Appalachians, which means more trails and more hills. Even though this post is about Frankfort, Louisville and Lexington deserve a plug. One of the largest municipal park systems in the US is less than one hour west in Louisville. Within that system is a seemingly endless number of trails including in Jefferson Memorial Forest. This is one of the largest municipal forests in the US at more than 6000 acres. Louisville is also working on the Louisville Loop. This is a more than 100 mile multiuse trail system that will eventually encircle the city and connect existing parks. Between Lexington and Louisville alone there are more than 200 parks. Even beginning to describe them would make this a multipart post. So, we will leave it at this for now except to say that, if you get a chance to run here, look into the many races and beautiful running locations. Check out Lexington’s RuntheBluegrass half-marathon March 31, 2012. It’s considered one of the most beautiful races in the area. Frankfort, KY is really a great place to run. There are also a number of people that are continually working to increase the amount of walking/biking trails in and around town such as the local non-profit group Walk/Bike Frankfort. You can’t use the excuse here that you have no place to run. Add to that the endless opportunities in this part of the state for 5Ks, 10Ks, marathons and half-marathon event throughout the year, and you practically don’t have time to sit down. Go find a road, go find a trail, go run.